I haven't posted to this blog since the first month I made it. Part of that is because I forget it exists, but I also struggle to decide what's "worth" posting. Obviously, this doesn't get read by other people. I'm not selling something exciting, offering a unique perspective, or sharing carefully crafted details of a mostly interesting life. Why do I take that to mean that I shouldn't post? Regardless of why, I'm hoping to re-begin documenting pieces of my life. 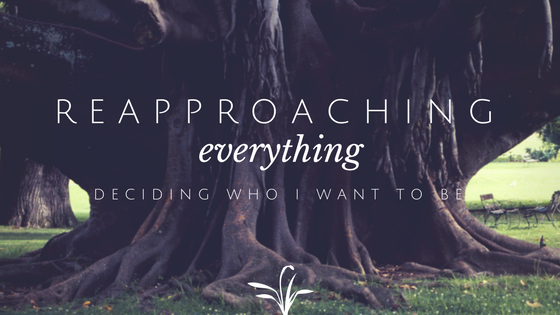 If nothing else, it helps me identify how I want to live, what I want to change, and who I want to be. I recently moved from a tiny studio apartment into a townhouse. By normal standards it's small and unexciting, but to me and my husband, Justin, it's our castle. Wood laminate floors throughout, white walls, and more than one bedroom. What a dream! Being able to design the look of each room has been a refreshing experience for me. I've been trying to be more intentional with my approach to design. What needs to be in this room? How will this room make us feel when we walk in? What can I do to make this space as functional as possible? It seems silly, but addressing my home in this way has really helped me reconnect with what I want out of my life. In forcing myself to arrange this home with purpose, I am creating the framework in which I can live out my day. This, in turn, seems to impact how I choose to spend my time. Honestly, I don't know if that makes any sense. But I suppose it doesn't have to. Like I said, this doesn't get read by other people. Other big change: marriage. It was just a boring civil ceremony before our actual wedding in August, it's only purpose to make us eligible for housing reimbursement from the military. Regardless, living with Justin and knowing that he is my husband is an interesting change to my identity. It's funny, realizing that a large part of who you are is defined by another person entirely. In a way I love it, but I have to learn not to fight against some of the control you relinquish when you combine your life with someone else's. This weekend we are also picking up our new corgi puppy. Scout (more often called Scoot), is an 8-week old Pembroke Welsh Corgi. Adding her into our lives is simultaneously exhilarating, fantastic, and terrifying (not to mention expensive). Taking on the responsibility of training a puppy is something I didn't expect to commit to this month, but here we are. Things just sort of fell into place, and it felt right. Justin leaves for California for three months in March, so we only have a couple of weeks left before he is gone. Most of the puppy training is going to fall on me because of it, but I think it will help pass the time while he's away. Anyway, all of that stream of consciousness rambling to say, I think I'm happy. It's weird, and different from the usual kind of happy I feel since I began taking antidepressants. That allowed me to feel happiness on a day-to-day basis again, but this is something different. It's not just contentment. I feel really satisfied with life right now. It's good. It's weird. 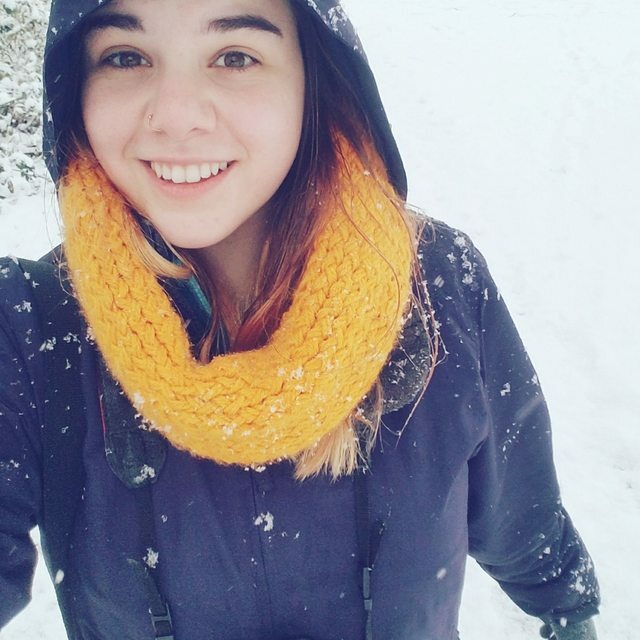 Of course, there are still days where depression rolls in and makes me feel like garbage, but overall I feel like a happy person. I like my job. I like my home. I like my husband and my friends and my family and my dog. I'm happy. I think that's all I ever really want to be. I'm no artistic genius, but I do take pride in spending time making arts and crafts. I've always been passionate about my projects, but I never took the leap towards selling them. Of course, as a kid I would make bracelets and earrings with my friends, and we had grand plans to sell them one day. But, entrepreneurial efforts are difficult when you've only just finished the fourth grade. In high school I began learning how to draw. I started selling small drawings on DeviantArt to people for an obscenely low price. Although I'm no Rembrandt, I was only charging between 5 cents and 2 dollars for different drawings. That was probably a bit low! In the last couple of years I've become really interested in woodburning, also called pyrography. Basically, you use a heat tool with a metal tip to burn designs into wood. I'm nowhere near as skilled as some of the other people out there, but I finally feel like I have something worth selling to others. 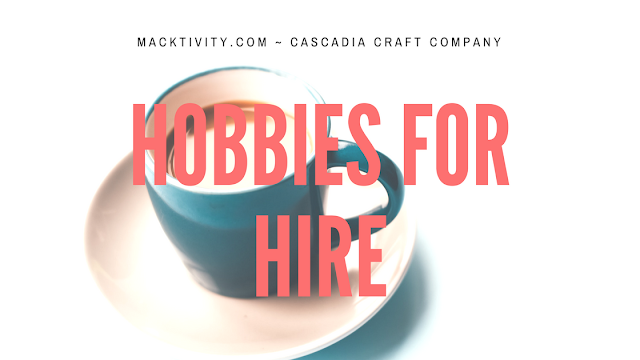 With that, I decided to open a store on Etsy: Cascadia Craft Company. At this point I only have about 20 items posted for sale, and certainly haven't made many sales either. All that said, the fact that I've managed to make any money doing something I really enjoy is an extremely rewarding thing to realize. I know this isn't something I'll be able to do for any real income, but it makes doing my craft projects feel more productive and meaningful. The fact that another person, a stranger even, will be enjoying and using something I created is a fantastic feeling! Some of the boxes I've sold have been a bit unusual. Coffin boxes were on sale for fifty cents a few Halloweens ago, and I just couldn't resist! These are more fun than most designs, though, because of the unique shape and fun themes to choose from. I'm not entirely sure what they'd be good for, but the best part about doing this as an after-hours hobby is that it doesn't hurt me if it doesn't sell. I think that's the best way to get started in selling crafts, although I suppose I haven't been doing it long enough to really say for certain! But, the risk is low, and the reward is harmlessly thrilling! For more of my crafts or to explore the store, visit my Etsy page! In other news, Costco currently has an excellent deal on the Silhouette Cameo 3, and I couldn't resist! I've been wanting one for ages and I finally felt like the bundle deal was worth the plunge. It's an online-only deal, so the 3-5 business day waiting period is killing me. I can't wait to get my hands on my new toy! Hopefully I can come up with some new ideas to share here. 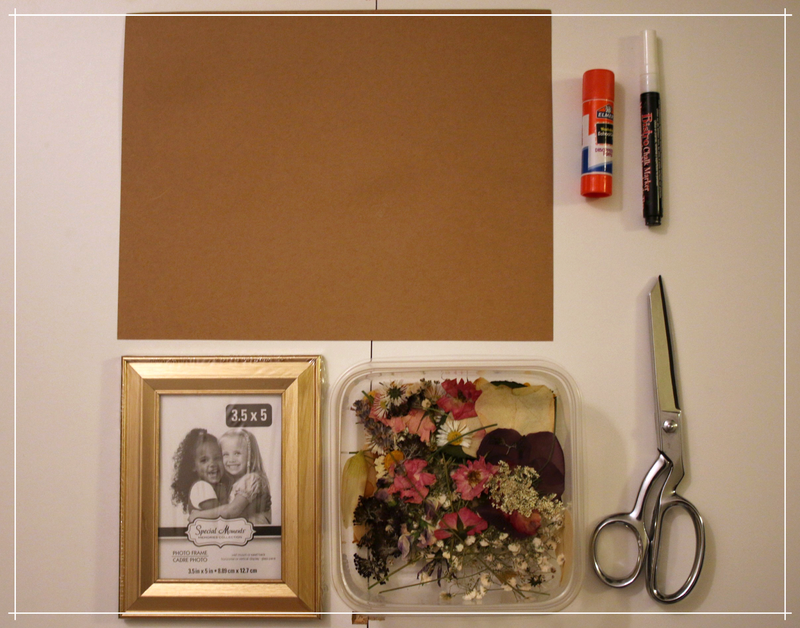 I'm all about being a DIY bride. Store-bought decorations are not only expensive, but also lack that personalized touch I'm hoping to bring to my wedding day. 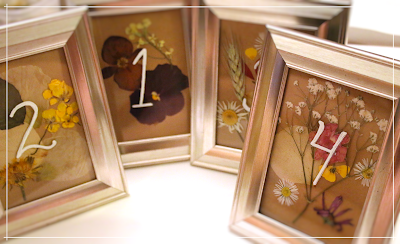 These cute, rustic table numbers are super easy to make, and cost only about $2 per number. All you need are a few supplies, some wildflowers, and a little bit of patience! First, you'll want to start collecting your wildflowers. 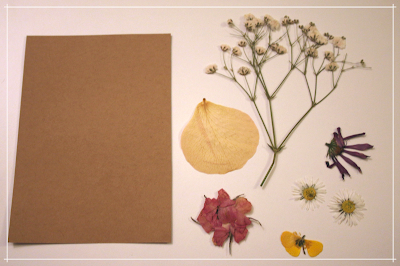 Most of the blooms I used were collected along the road, behind my workplace, and from the grass outside my apartment. Tiny daisies and buttercups press beautifully, the rich yellow staying vibrant even after time between the pages of a book. 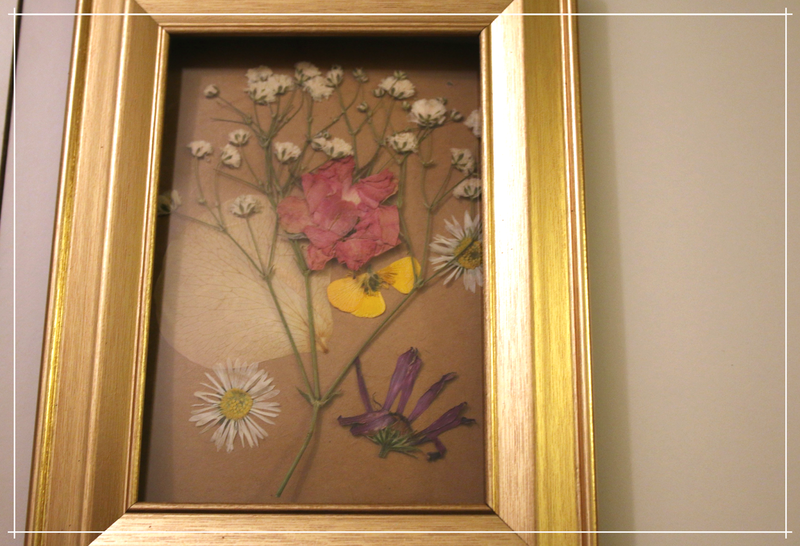 I also clipped flowers from my garden. I have a small collection of plants on my balcony, and I specifically selected a few varieties of pansies and poppies that I knew would press well. 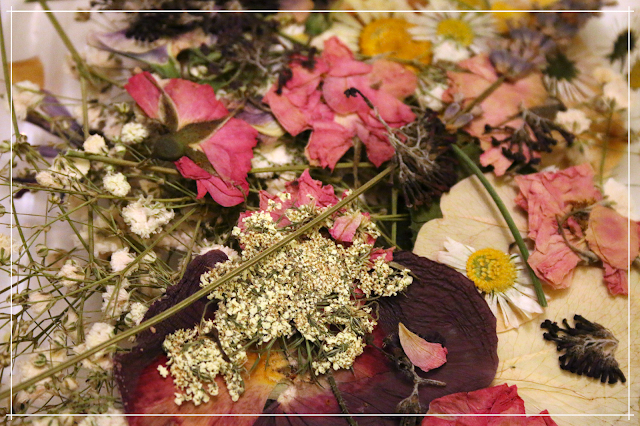 Lavender, rose petals, baby's breath, small leaves, and other little blooms look nice too. I waited about two weeks for each set of flowers. I've been pressing these over the course of a few months, but that has more to do with the availability of flowers than anything else. 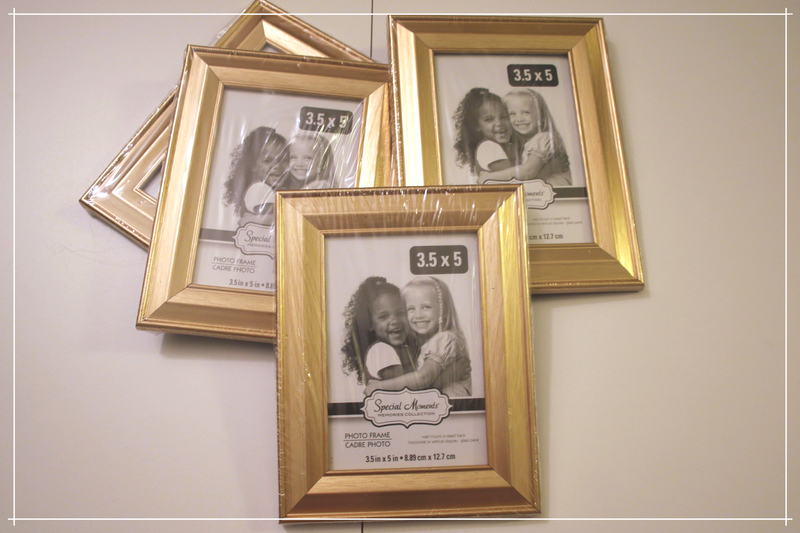 I found these awesome frames at the Dollar Tree for (unsurprisingly) one dollar each! Although somewhat cheap and flimsy, they look really nice and will definitely do the trick for my wedding day. I purchased ten of these, and am hoping I don't end up needing more than 10 tables! Obligatory flat lay of the dismantled frame. Gather your supplies. I used brown kraft paper for the background, but you could use any color you wanted. You'll also want a chalk marker, although I imagine a paint pen would work just as well. 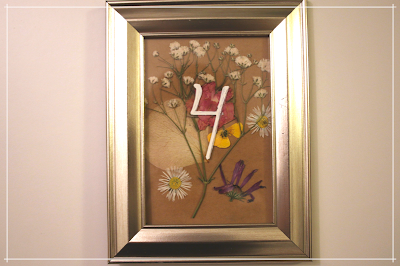 And, of course, your flowers! I just used the little picture that comes with the frame, traced it on the kraft paper, and cut out as many as I could on one sheet. Pretty straightforward. Now, the fun part. I keep my flowers in a plastic container with the lid kept off. I'm paranoid about moisture affecting the flowers, so I've been doing what I can to keep them cool and dry. From here, you'll want to pick out your flowers for the frame. I recommend choosing some plain, background petals (such as rose or poppy), a taller, multi-leveled flower (the baby's breath), and a couple of colorful blooms to make it really pop. 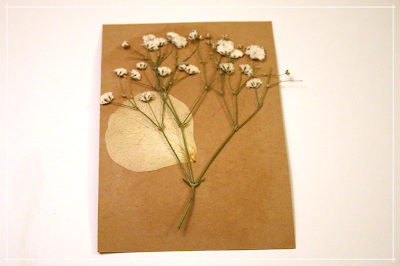 Coat the paper in glue. A regular gluestick is fine. 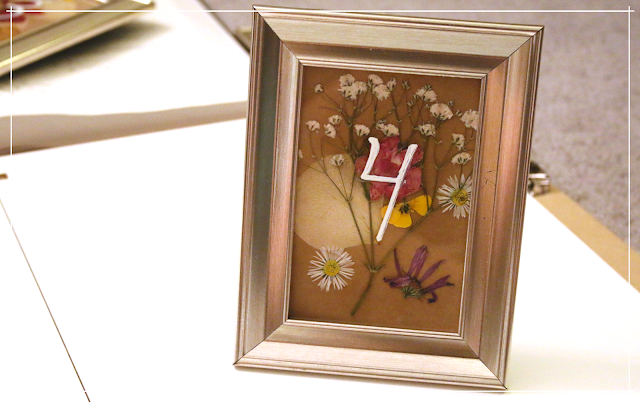 The glass will hold the flowers to the paper pretty well on its own, you just want a little bit of glue to keep them from being able to move around. 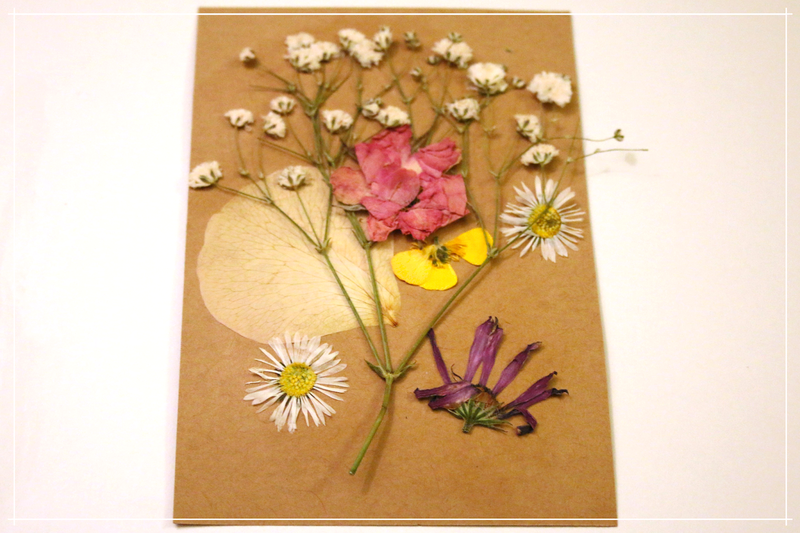 Layer the pressed flowers, adding more glue as needed. When finished, allow the glue to dry before putting the frame back together. I made the mistake of not waiting once, and had to take the glass back off and wash it. (Oops). 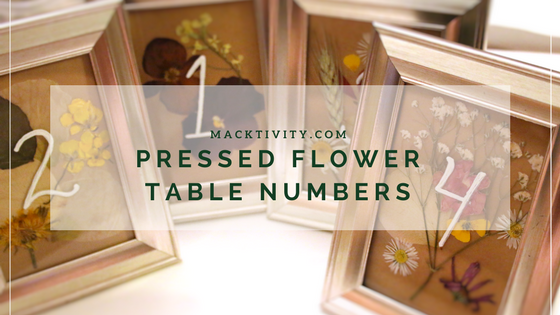 From here, you just need to use the chalk marker to write your table numbers on the front of the glass. All done! I'm hoping to sell these on a local buy/sell/trade page after my wedding next August. I've been struggling lately with wedding decor ideas. 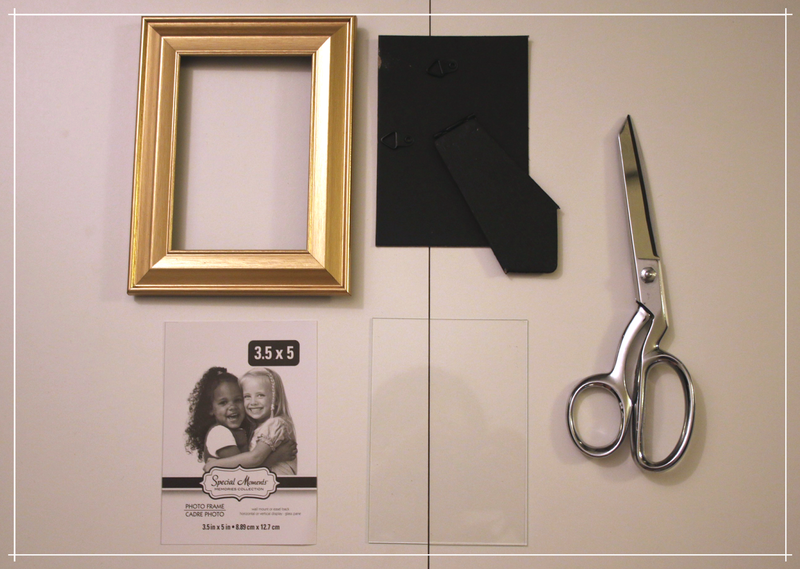 Thus far, I have these frames, a vague idea of centerpieces, and a lot of half-finished chalkboard signs. I'm torn between feeling bad about my punched-in-the-face-by-Pinterest wedding and being so excited to make decorations! I'm hoping to make my own aisle markers next. What DIY project are you looking forward to next? Mack Butler	Craft. Cook. Create. Follow my shop on Facebook!